Elasto Proxy announces rubber and plastic parts for marine applications such as shipbuilding and boat repairs. Sealing and insulation specialists can design and custom-fabricate window seals, latch seals, acoustical and thermal engine bay insulation, edge finish trim, rubber bumpers, anti-slip pads, access hatch seals, and watertight compartment sealing. Elasto Proxy can design and custom-fabricate window seals, latch seals, acoustical and thermal engine bay insulation, edge finish trim, rubber bumpers, anti-slip pads, access hatch seals, and watertight compartment sealing. Elasto Proxy, global supplier of custom seals and specialty insulation, is announcing rubber and plastic parts for marine applications. Designed for demanding environmental conditions, these high-qualilty components are made of marine materials that can withstand water, saltwater, wind, sunlight, and temperature extremes. As Elasto Proxy explains in a new technical article, How to Select Marine Rubber and Plastic, buyers must also account for application requirements and technical designs. A compound that’s right for a window seal on a commercial fishing boat or naval frigate may not be recommended for muffling the sound of a diesel engine. For marine buyers and ship builders alike, smooth sailing starts with compound selection. Boats are built of many different materials, of course, so rubber and plastic parts must also support larger designs that include metals, composites, and wood. Ships and boats need high-quality rubber products – including for watertight compartment sealing. Parts such as a latch seal on a ship’s deck, a porthole or window seal that’s close to the waterline, or an access hatch seal for an engine room serve important functions. For naval applications, sealing and insulation are also mission-critical. 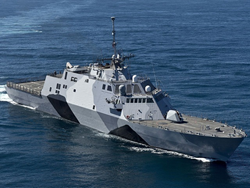 As the image that accompanies this press release shows, the first littoral combat ship (LCS) in the U.S. Navy, the USS Freedom, has several rows of windows. Seals aren’t the only rubber products that can require specialized characteristics. Acoustical and thermal engine bay insulation is also critical. Often, silicone is used because this synthetic rubber can resist high temperatures while providing acoustic insulation from high-decibel diesel engines. As Elasto Proxy explains in its article, self-extinguishing firestocks and custom composite insulation provide buyers with additional options. By building sandwich-like composites, the custom fabrication specialists can form application-specific shapes and thicknesses. Civilian ships such as yachts, sailboats, tug boats, and fishing vessels also use parts such as plastic trim and rubber bumpers. Since the company’s founding 25 years ago, Elasto Proxy has served both the military and maritime industries. Today, light-up rubber bumpers are one of the many solutions that Elasto Proxy offers. Equipped with long-lasting, energy-efficient LED lights, each elastomeric bumper is designed to illuminate the location of quays, pontoons, docks and embankments while protecting marine structures against impact by boats or ships. For more information, contact Elasto Proxy or request a quote today.